Mass Communication PowerPoint templates, backgrounds Presentation slides, PPT Themes and Graphics. Download our mass communication PowerPoint templates visiting our official website slidegeeks.com. We are having a splendid assortment of mass communication PPT slide templates that one can download and customize as they want. These communication templates are suitable in case you need to represent any information to the large segment of the population in one go. The graphics are created keeping the media source in mind. Our PPT presentation templates bring universality for the acceptance of presenter’s message with strong visuals. Launching new business or product? Making plans with your management and sales team? Make wide circulation strategies using our mass media communication strategy PowerPoint templates. Our readily available PPT slide template designs facilitate to easy interpretation for new information to be delivered and exchanging apt cultural values. You can also create an international market for your products and services. As advertising becomes easier. You can inform the demand, price and supply of the market covering wider area to your staff with our innovative mass media communication PPT templates and designs. You can edit the shape, size and color of these PowerPoint slides and make an impressive presentations. Free download section on top left is available for your assistance if you do not want spend for your presentation. 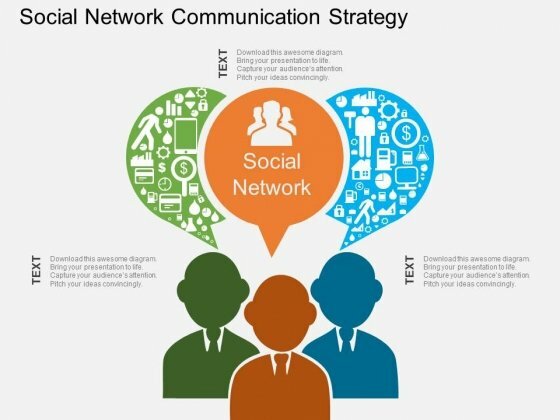 This business slide displays diagram of social network and communication strategy. Download this diagram to display information in visual manner. Visual effect of this diagram helps in maintaining the flow of the discussion and provides more clarity to the subject. 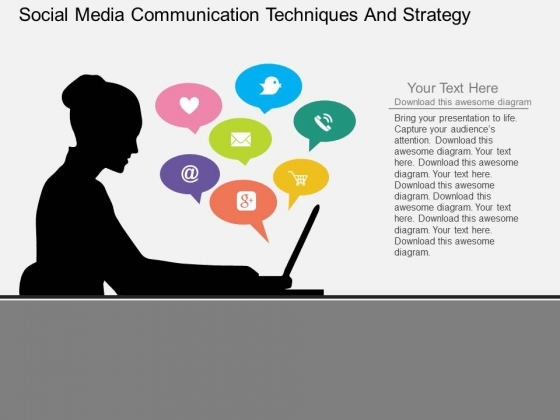 Arouse the excitement with our Social Network Communication Strategy Powerpoint Template. Stir up the audience with your views. This business slide displays social media communication techniques. Download this diagram to display information in visual manner. Visual effect of this diagram helps in maintaining the flow of the discussion and provides more clarity to the subject. Exclaim to the world with our Social Media Communication Techniques And Strategy Powerpoint Template. Advertise your ability to everyone around. Create dynamic presentations with our professional template containing megaphone with three social media icons. Use this diagram to exhibit social network advertising. Download this template to leave permanent impression on your audience. Take the plunge with our Megaphone With Three Social Media Icons Powerpoint Slides. Success will surely ensue. Any kind of announcement is important, some less some more. You can use this professionally designed PPT template to include an announcement such as a sale or price drop in your slide to be passed on to your customers, colleagues, employees or clients of an organization or business. The megaphone or the speaker can also be used for presentations related to radio, audio or mass communication or news. It can be an ideal slide for a company who is making their sales or profit figures public. The text on the left can be used to make a transcript of the audio clip or give details and descriptions of the announcement. The text can be customized and matched to the importance and seriousness of the announcement. 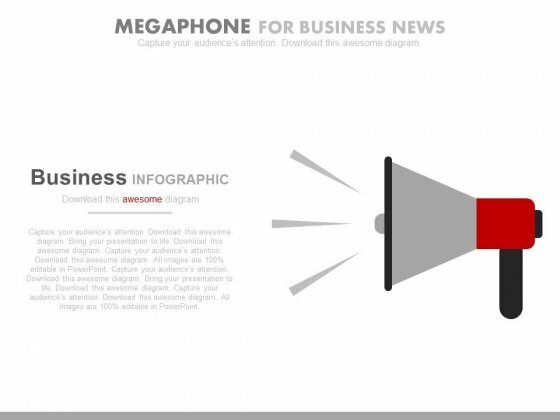 Take the plunge with our Megaphone For Business And Marketing News PowerPoint Slides. Success will surely ensue.